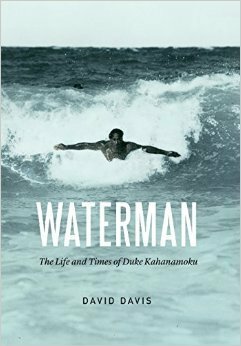 Long before Michael Phelps and Mark Spitz splashed into the pool, Duke Kahanamoku (1890-1968) emerged from the backwaters of Waikiki to become America's first superstar swimmer. The original "human fish" won Olympic gold medals, set dozens of world records, and topped the world rankings for more than a decade. His rivalry with Johnny Weissmuller helped transform competitive swimming from an insignificant sideshow into a headliner event. Kahanamoku used his Olympic fame to introduce surfing, an activity unknown outside of Hawaii, to the world. Riding his traditional wooden longboard, he helped spread surfing to Australia, to the Hollywood crowd in Southern California, to the New Jersey Shore, and beyond. 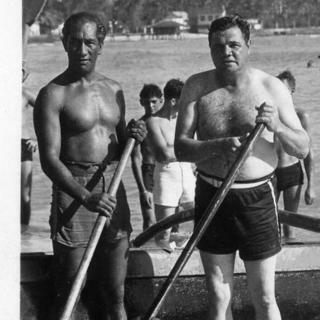 No American athlete has influenced two sports as profoundly as Duke Kahanamoku did, and yet he remains an enigmatic and underappreciated figure: a dark-skinned Pacific Islander who encountered and overcame racism and prejudice long before the likes of Joe Louis, Jesse Owens, and Jackie Robinson. Kahanamoku's deep connection to his homeland is equally noteworthy. He was born when Hawaii was an independent kingdom and later served as the Sheriff of Honolulu during Pearl Harbor and World War II. He campaigned for statehood for the Hawaiian Islands and, as the globetrotting "Ambassador of Aloha," was Hawaii's most famous son until Barack Obama came along. As one sportswriter put it, Duke was "Babe Ruth and Jack Dempsey combined down here." That wasn't much of an exaggeration.